I just wanted to tell you a story about how magical these cubes are. I have a 10 year old client who is very angry at her parents for getting divorced. Yesterday she came in and noticed the cosmic cubes. I said hey let’s play this game. She was incredibly intrigued and took each block and threw it on the table and whatever it landed was her word. There were 7 words and she quickly wrote a story using these special words. I truly had not seen this child laugh or smile in the two months I’ve known her. This was a profound moment. We will use this each week and develop her story. This is FABULOUS for therapists with all people but especially with bright imaginative children! As a mom, I love Cosmic Cubes for the connection they allow with my young son. I so enjoy a creative endeavor, and this allows the two of us to have endless conversations about words, their meanings, how their meanings can change based on context, etc. It helps him with his creative thinking and also with writing, as he arranges the words he rolls into sentences and writes them down. 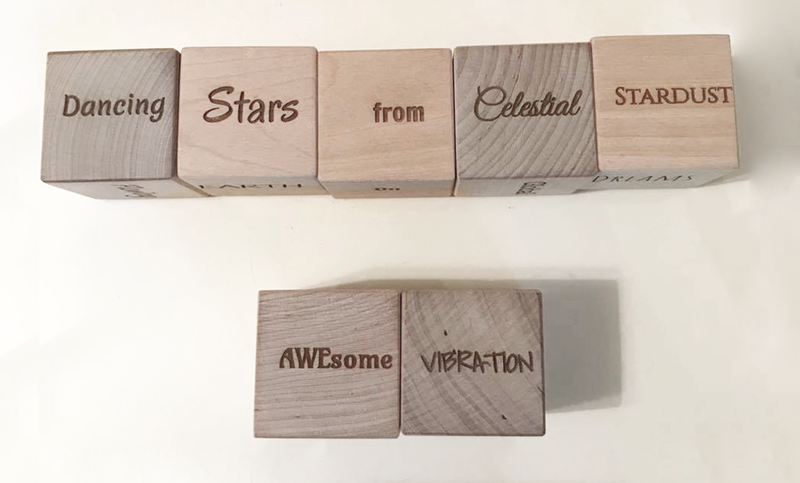 For myself, I love the Cosmic Cubes as a way for the Universe to speak to me, and I especially love that they merge spirituality with playfulness and fun, as the two are not mutually exclusive, but are often portrayed that way. I appreciate the natural materials, too, as opposed to plastic. These have a solid, high quality feel to them. Cosmic Cubes are totally genius!! I am obsessed with my cosmic cubes!! I get excited with every roll to see what’s in store. they are the perfect tool and reminder that we are always held by the universe, and each message is always divinely timed. I cannot recommend Cosmic Cubes enough! "I see them as an instrument of playful communication with my cosmic self” "Like a walkie talkie to my Soul!”💛" A fun game to play with your higher self! I just love my Cosmic Cubes! They are such a fun way to help me reshuffle my thoughts into positive paths. Anytime I feel “stuck” I’ll turn to my cubes and I always feel a sense of positive energy flowing in. Every roll gives me that push to open up my mind and listen to what the universe is trying to tell me.